All forty, 1983 FHP Mustangs at their introduction. 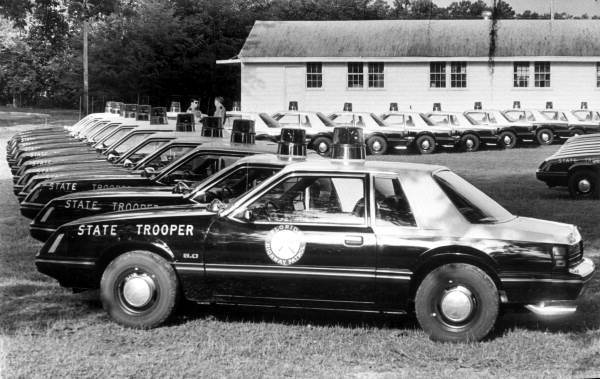 1983 photo taken at the FHP Training Academy in Tallahassee. Mark Foley Photo. Another shot of the '83s, with a Trans Am test vehicle. The T/A has the VHF Micor antenna on the roof, but none of the Mustangs appear to have antennas and probably hadn't had the radios installed yet when these pictures were taken. Mark Foley Photo. 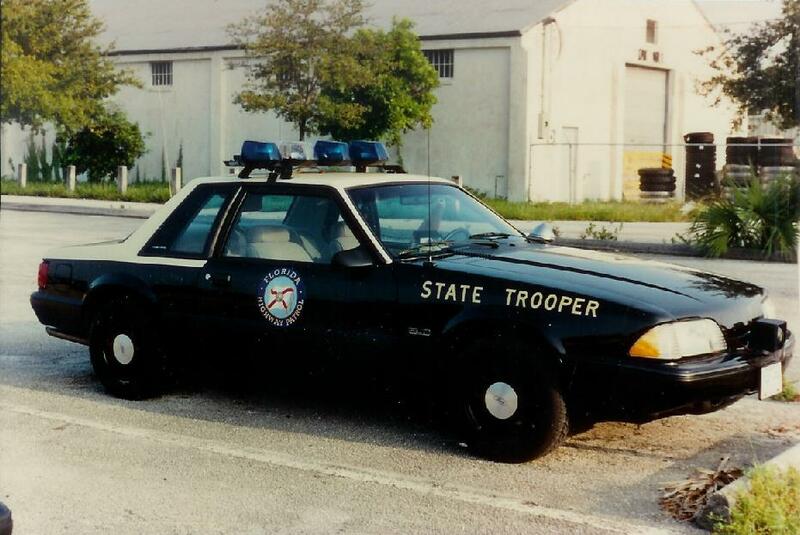 Rare shot of a 1983 FHP Mustang at the Ft. Pierce, FL, FHP station. FHP Photo. Another 1983 Mustang, stuck in the median on the Turnpike in South Florida. This is a nice photo showing the one-year only, Federal CJ184 beacon, as well as the Micor VHF antenna on the roof and the UHF repeater antenna on the decklid. The other, long whip antenna is probably for a CB. FHP Photo. 1983 Mustang, unit #1509. Nice shot of the older plates, used through about 1987. Monty McCord Photo. One more, in-service 1983 Mustang. No vent visors on this car, like the others above. The '85 below doesn't have them, either. FHP did use these often, but they were not installed on every single car. 1984 Mustang at a traffic checkpoint. 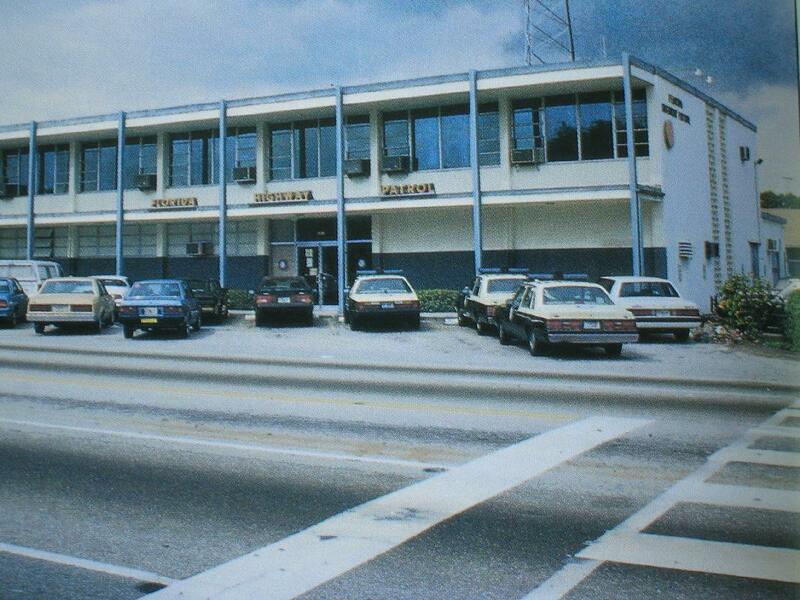 FHP used Jetsonics on their Mustangs starting in 1984. FHP Photo. 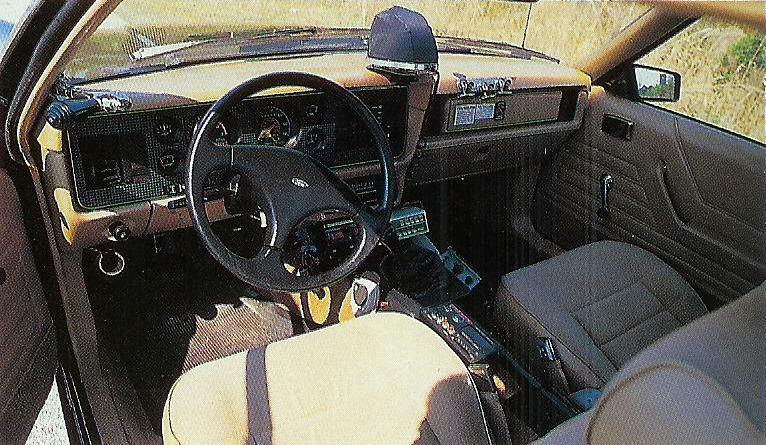 1984 Mustang interior. JSS switchbox, used with Jetsonics on Mustangs starting in 1984 and through the 1993 cars. 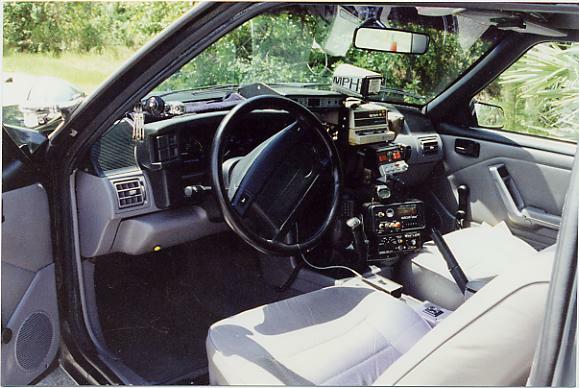 Single-tier Micor, which were used interchangeably with the dual-head Micor radios through 1993. VASCAR unit is installed between the seats, and a Federal PA 200 handles the siren duties. The Blue light on the dash is probably a Federal Fireball II teardrop, or SVP teardrop. Mustang Chronicle Photo. 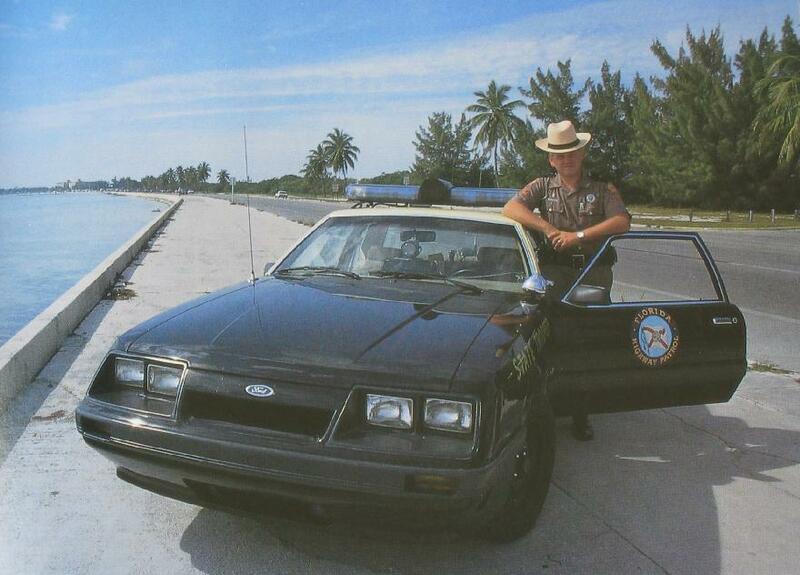 1985 Mustang, Troop E, in the Florida Keys (across the street from the Key West FHP station). FHP Photo. Another shot of the 1985 above. Argent center caps, good shot of the fender lettering and VHF/repeater antennas (again, another possible CB antenna on the decklid). FHP Photo. 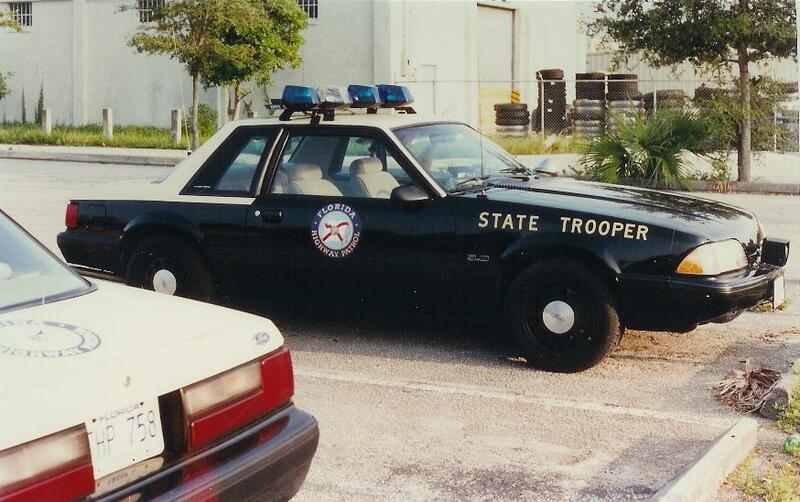 A 1986, parked in front of Troop E Headquarters, Miami, sometime in 1987. FHP Photo. 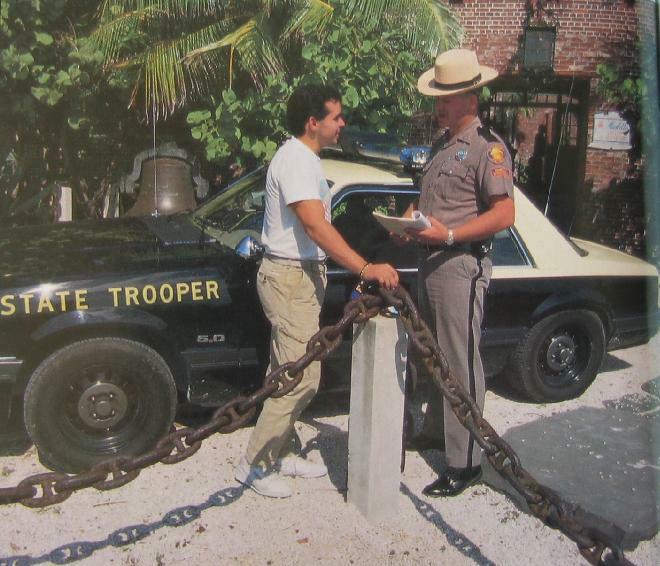 Another 1986 Mustang at an accident scene in the Keys, 1987 photo. This one has roof numbers, which started appearing around 1987, and vent visors. The '86 above doesn't have roof numbers. FHP Photo. 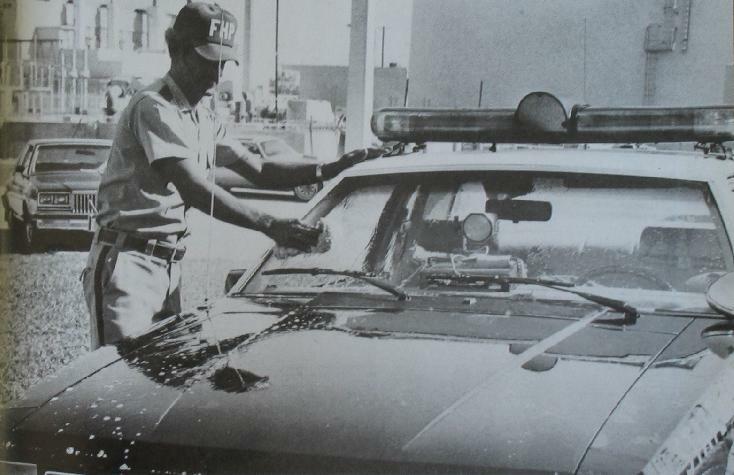 1986 Mustang being washed by an FHP employee, 1987. Nice shot of the MPH radar and Micor roof antenna. FHP Photo. 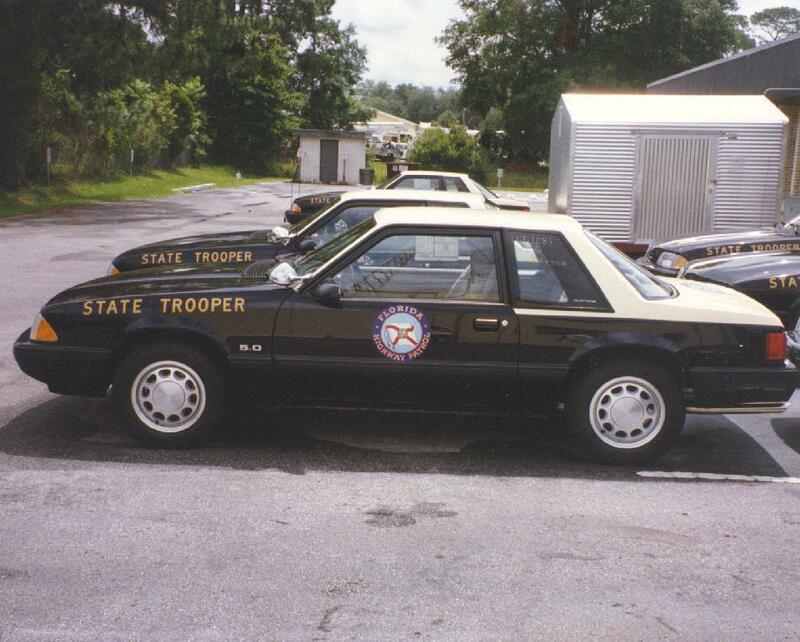 Another 1986 FHP Mustang. This one looks to have a Decatur radar installed, and also doesn't appear to have roof numbers yet. 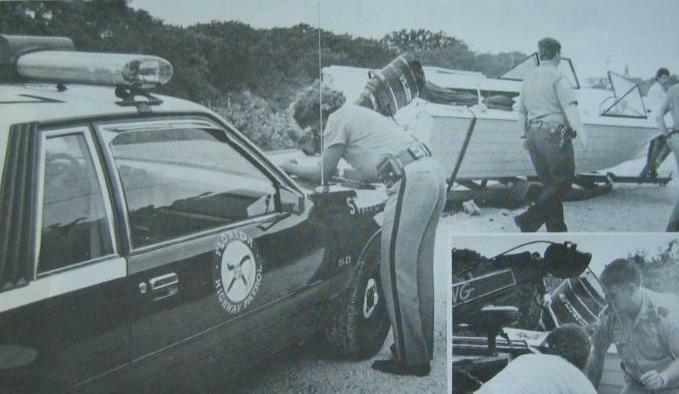 This car also had pushbars on the front bumper, which were unusual for FHP Mustangs. FHP Photo. 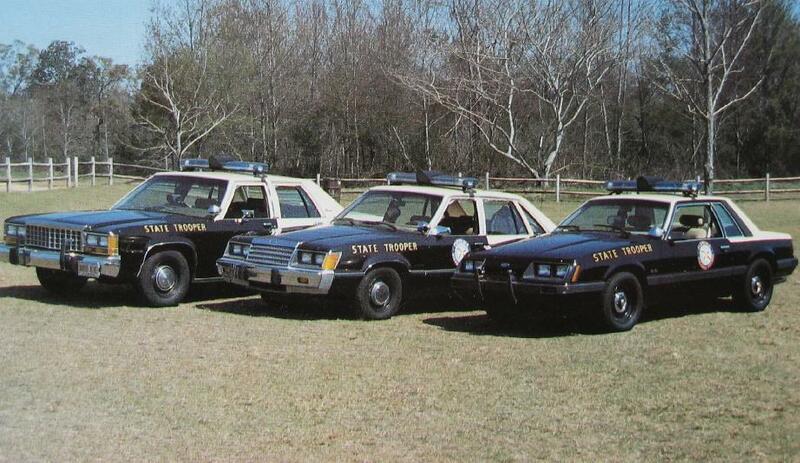 The 1986 above, along with an LTD II and Crown Victoria. 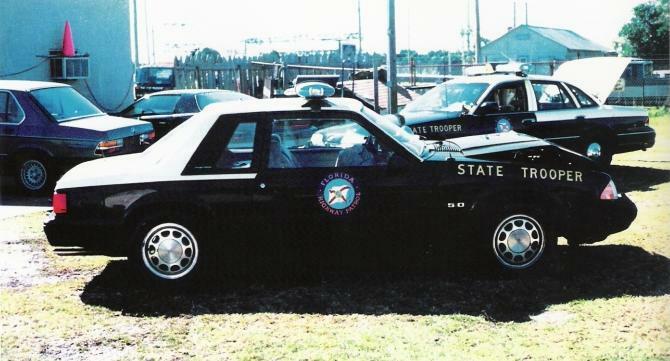 The CV has a Kustom radar, which further illustrates that several different brands of radar were used (some were provided to the Troopers by County governments). 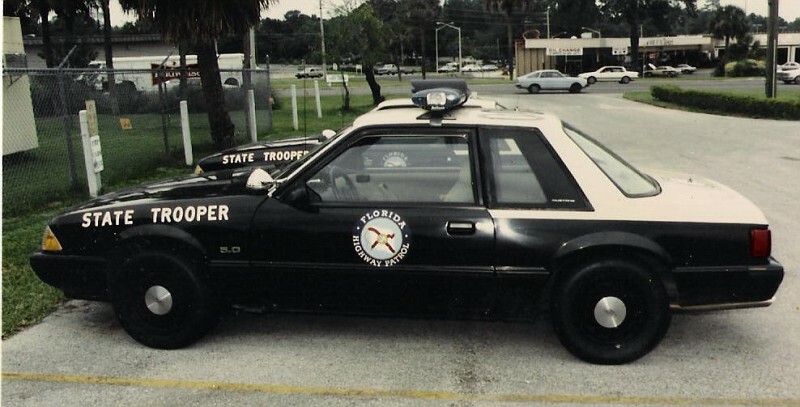 The "Arrive Alive" plate on the CV was also seen regularly before FHP began running front plates again (around 1987-1988). The plate in the picture is the older, orange version. FHP Photo. Another 1986, with an unusual antenna arrangement on the decklid (2 lip mounts). Mustang Chronicle Photo. Another, push-bar equipped 1986 Mustang. This one also has some unusual front flashing lights. Mustang Chronicle Photo. 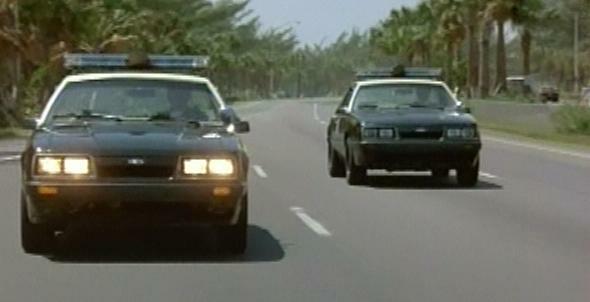 Two in-service, 1986 Mustangs from the Miami Vice television show, shot in 1986. 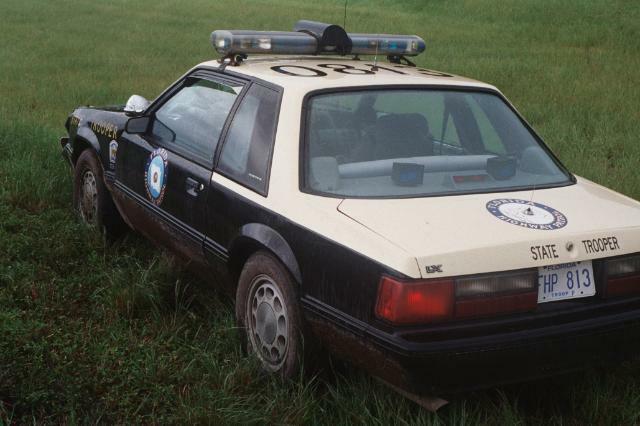 Real officers (and their vehicles) provided security during filming (extra-duty jobs for the officers) and the officers also appeared in certain scenes. Totalled 1986 Mustang. This is a good example of the masking in the trunk area that Ford usually did when the black paint was applied over the cream. Cars have been seen without masking in the area (all cream in the area where the quarters and trunk meet), but the black/cream paint break in the trunk is the norm. 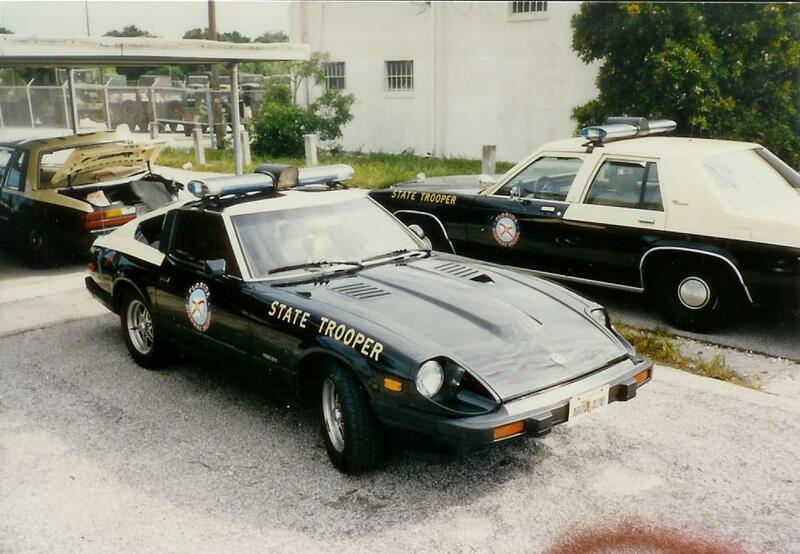 The front plate on the 280Z is the newer, green, "Arrive Alive" plate seen on some '85-'86 cars, prior to FHP running front and rear license plates. 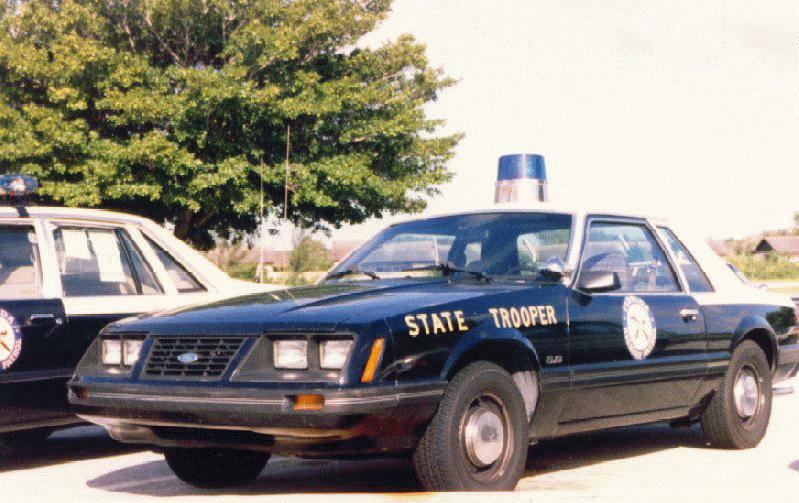 Great shot of the rear of a 1987 Mustang, unit #964, Troop D. It looks like the Trooper assigned to this car added a "police interceptor" decal to the trunklid and mudflaps behind the rear wheels. 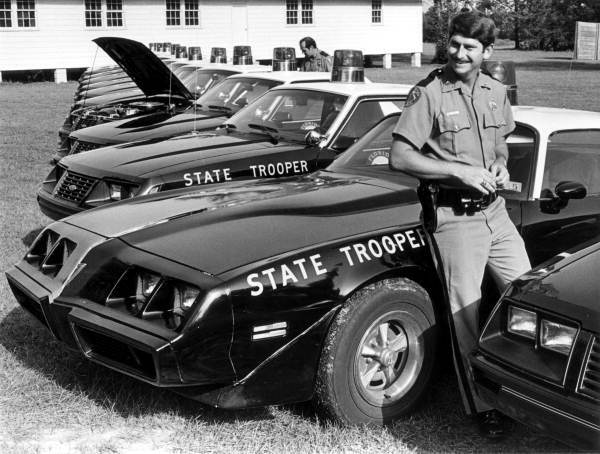 Troopers were usually free to add dashlights or CB radios, but weren't normally allowed to make any permanent changes to the cars. 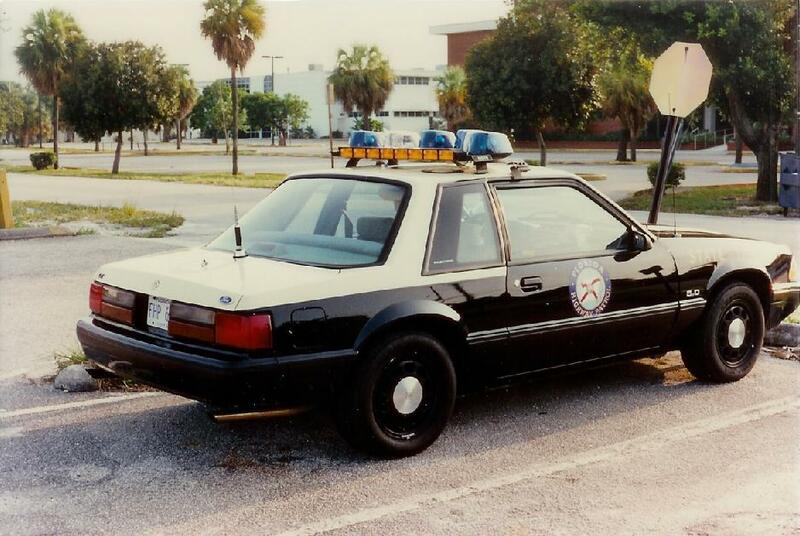 This car has vent visors, and the pic is another nice shot showing the Micor antenna (roof), repeater antenna (decklid), and the newer plates that FHP started using around 1987. 1987-1989 Mustangs, with the typical Micor antenna up top and repeater antenna on the trunk. E Prince Photo. 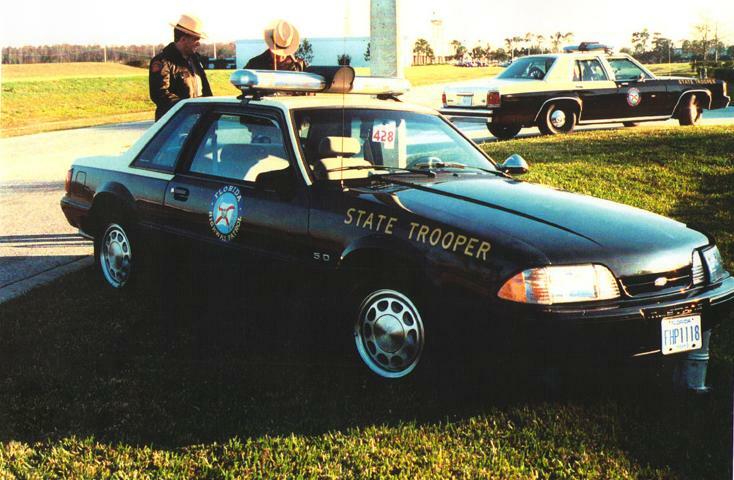 1987-1989 FHP Mustang with a Vector bar. 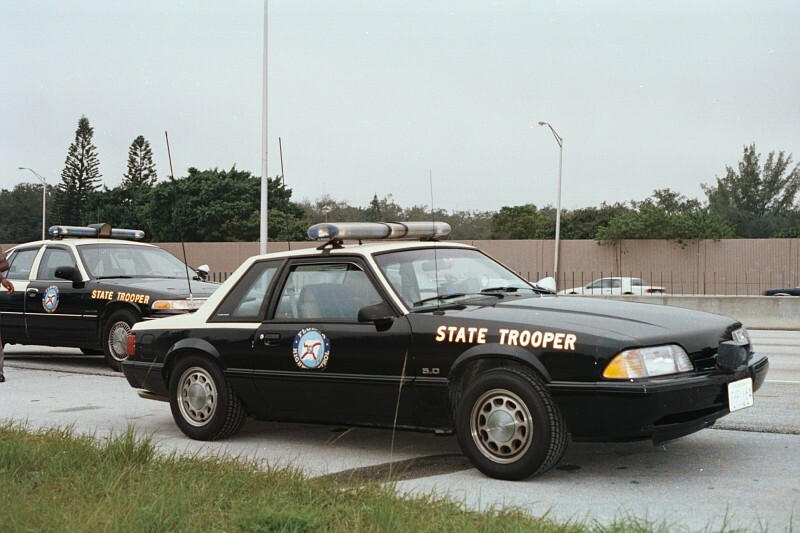 FHP eventually went to widespread use of this bar, but very few Mustangs ran them. The siren speaker was relocated from the bar (in Jetsonic apps) to the front bumper on this car. 1991 photo. Another shot of the Mustang above. Micor antenna on the roof, repeater on the trunk, trunk lip mount antenna is probably a CB radio (non-permanent mount). 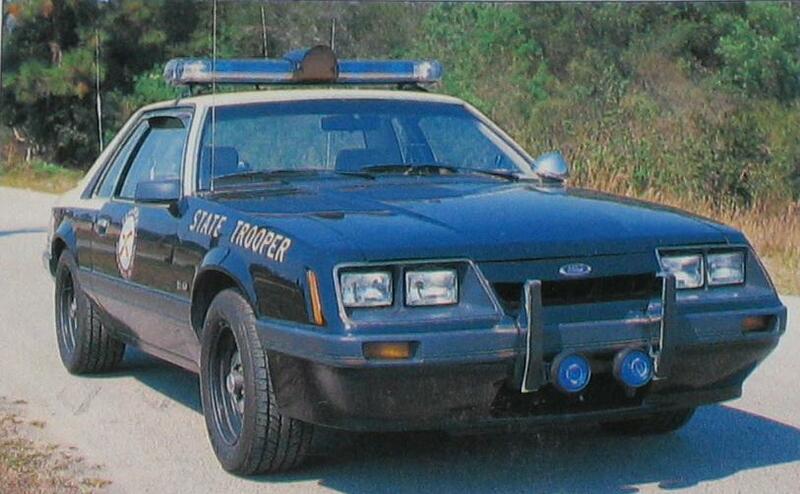 One last shot of the Vector-Mustang, identifying it as a Troop L car. No vent visors were installed on this car, either. 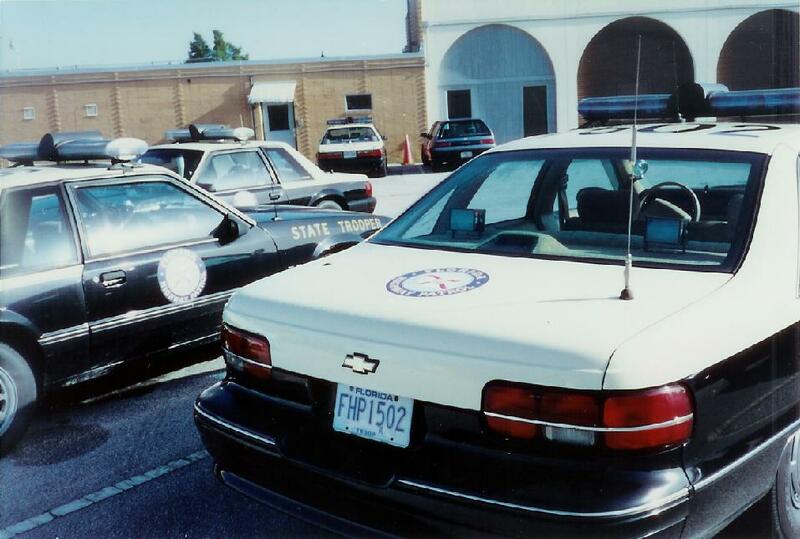 Several 1990 cars, including a '90 or '91 unmarked, at a Troop L station in the early '90s. 1992-1993 cars awaiting lightbars and other make-ready equipment prior to being placed into service. 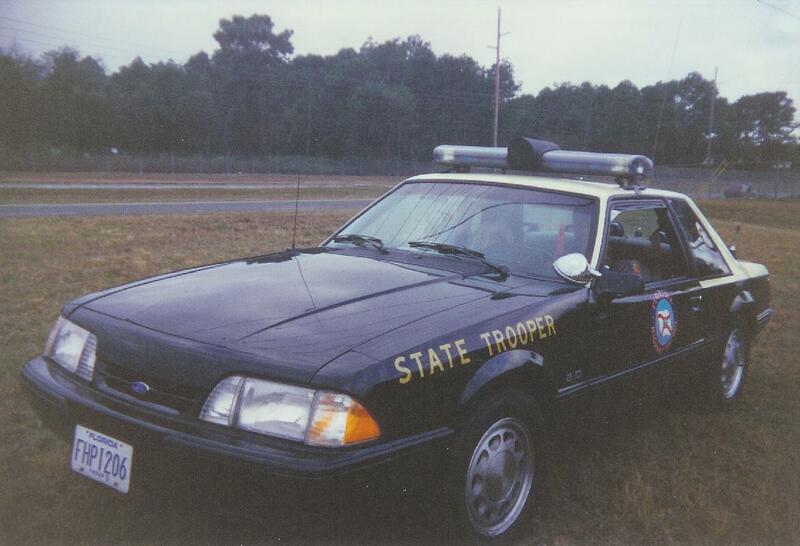 The first Mustang is unit #1081, Troop G, Palatka, which is written on the window in grease pencil. Another 1992 or 1993, unit #1659, awaiting lightbar and radio equipment prior to service. Unit #1659. E Prince Photo. 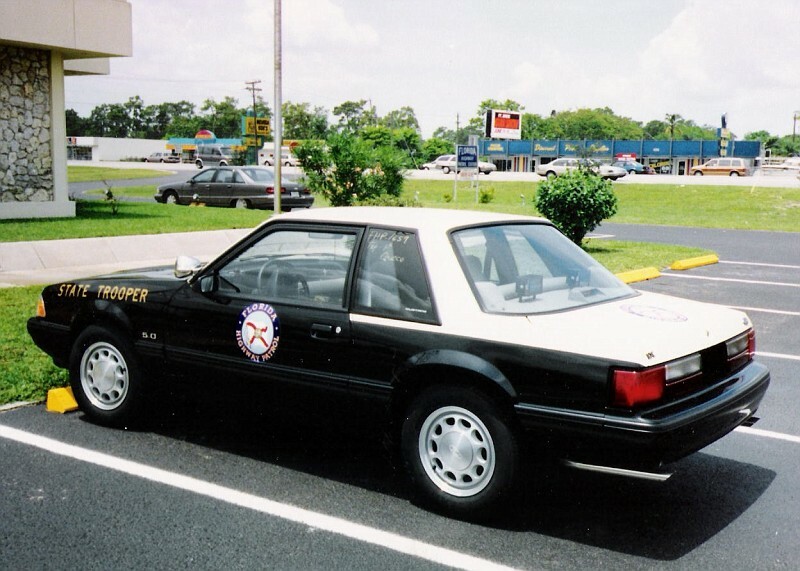 1992 Mustang, Troop D, unit #1206. This car has the rare, round Tomar (Federal) strobes on the back deck. 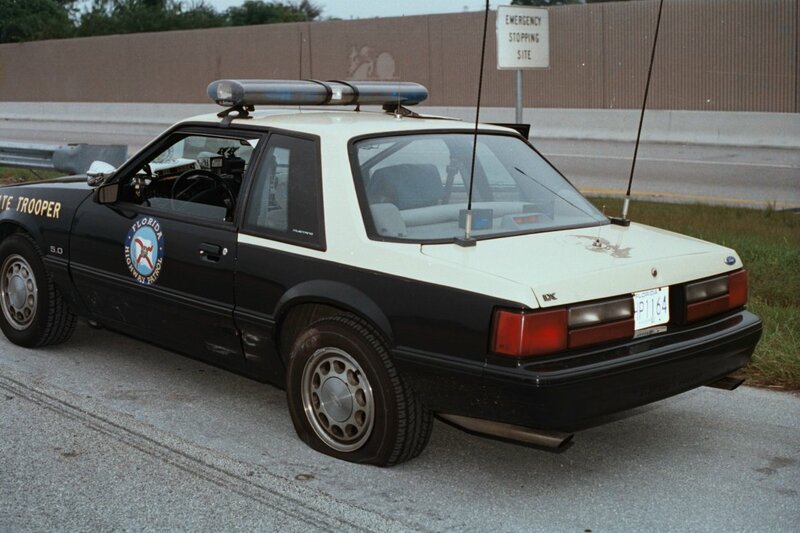 This car was still in-service in 1998, and the antenna on the trunk (passenger-side) is probably for the 800 MHz system. 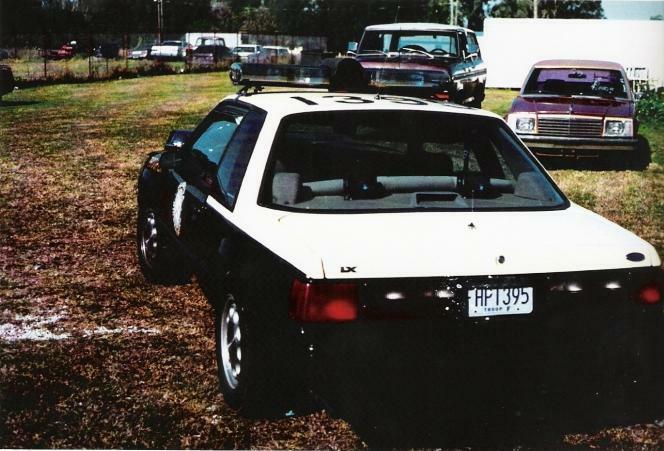 The other antenna on the trunk is a K40 for a CB radio, and the roof antenna is for the Micor, as this car would have had both radios still. Three 1992-1993 Mustangs, early '90s photo. The outer two have vent visors installed, while the middle one doesn't. E Prince Photo. 1994 photo, several Troop K Mustangs in the background. The trunk of the Caprice shows the typical Turnpike antenna setup; 2 side-by-side (decklid on full-size cars, top of the quarters, next to the trunk, on the Mustangs). This particular car probably has the left antenna hole plugged as a result of the 800 MHz radio conversion. 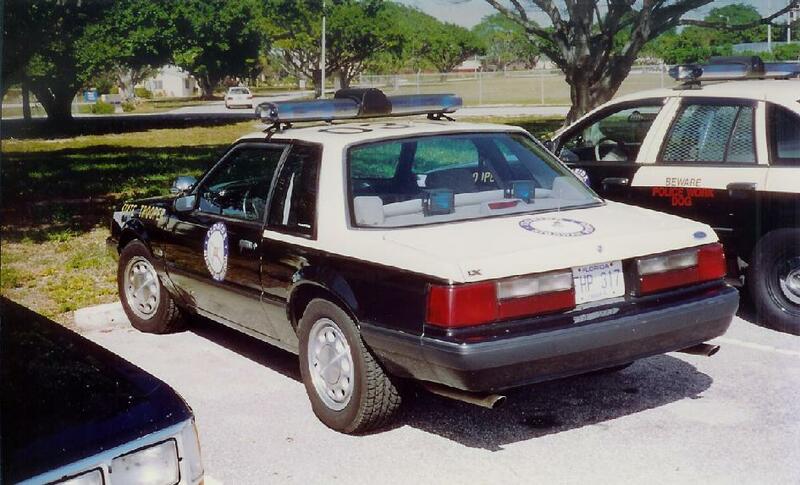 Troop K cars in S. Fla received the new radios in 1994, and the new portables (handhelds) weren't used with trunk mounted repeaters. 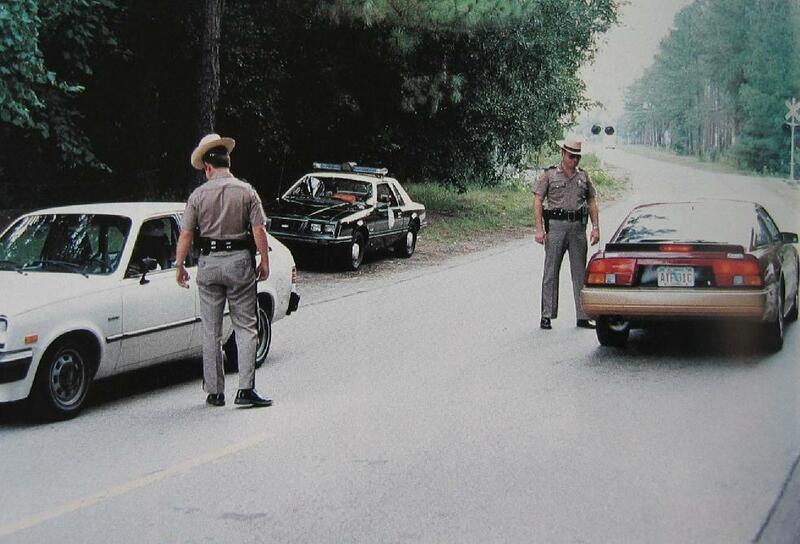 FHP still kept Micors in the cars, since the rest of the Patrol still used the low-band radios. The dual band antenna on the right may have been used temporarily for both Micor and repeater. 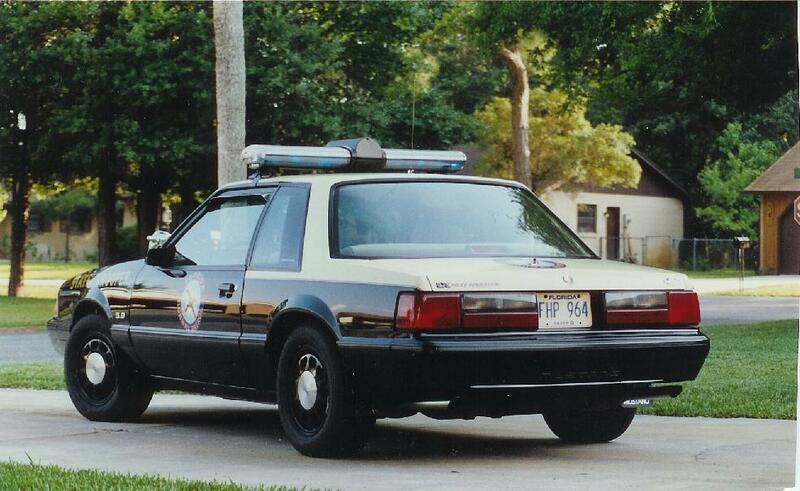 1994 photo, unit #317, Troop L. Great shot of the back of this car. Federal decklights, which were sometimes used, and the dual antenna setup for the Micor (roof) and repeater (trunk). Troop L didn't receive the 800MHz radios until 1998. No vent visors on this Mustang, but the Crown Vic next to it has the tinted, plastic ones installed. 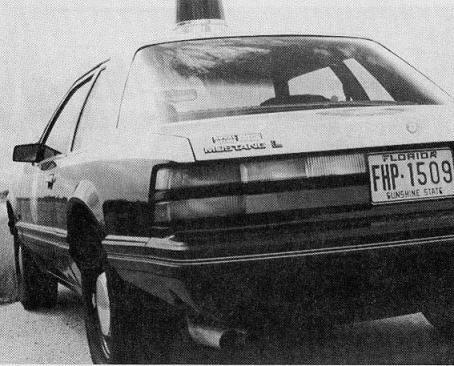 1991 FHP unit #1395, from a 1995 crash photo (attempting to catch up to a speeding car). 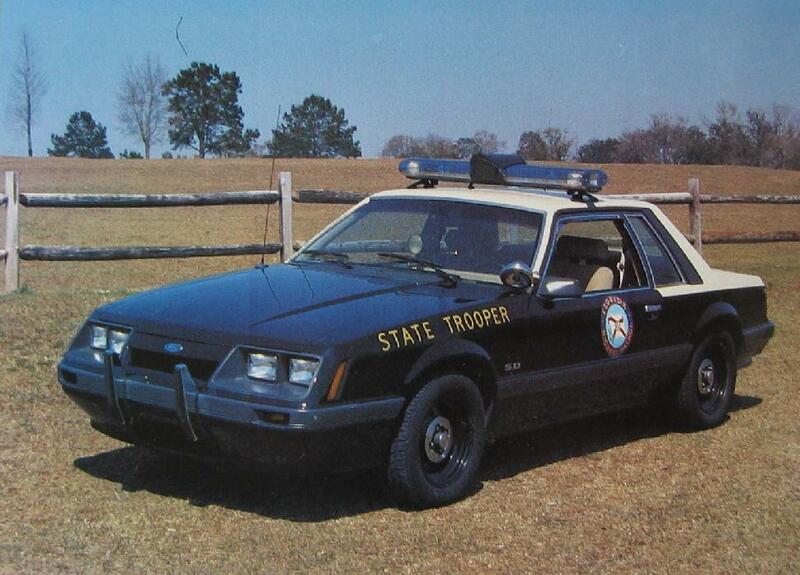 This was a Troop F car. FHP Photo. Another shot of 1991 FHP unit #1395. FHP Photo. 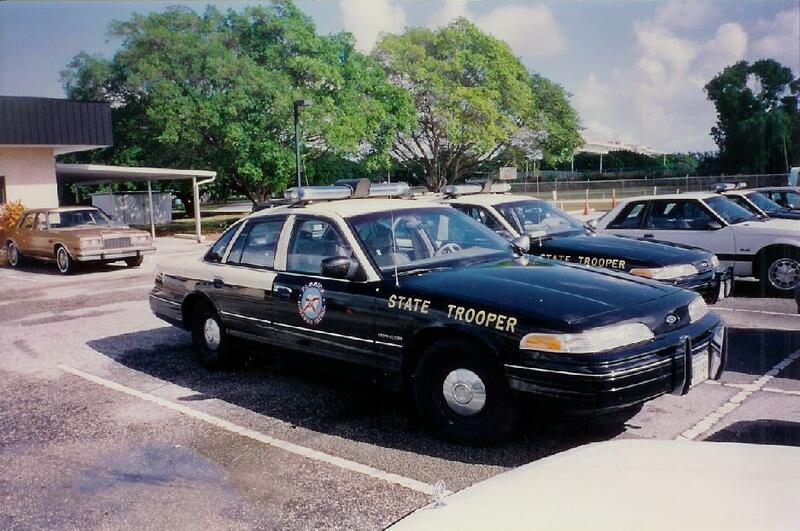 One last pic of 1991 FHP unit #1395. This car had Federal deck lights, and one of the many variations of font on the license plates (3M testing). FHP Photo. 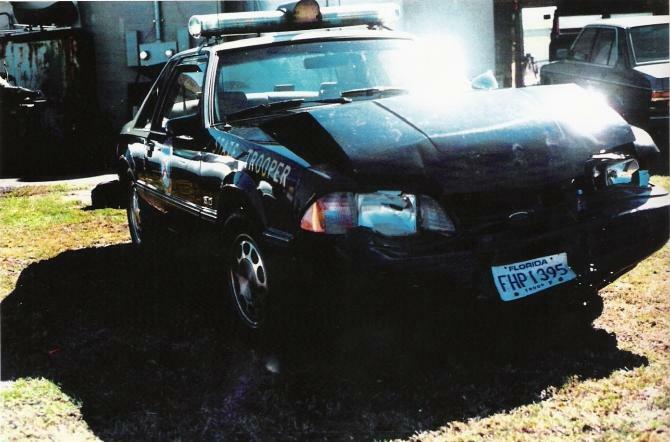 1992 FHP unit #1118, from a 1994 crash photo (dealership mechanic test drive gone bad). FHP Photo. Another shot of 1992 FHP unit #1118, up against a fire hydrant. FHP Photo. 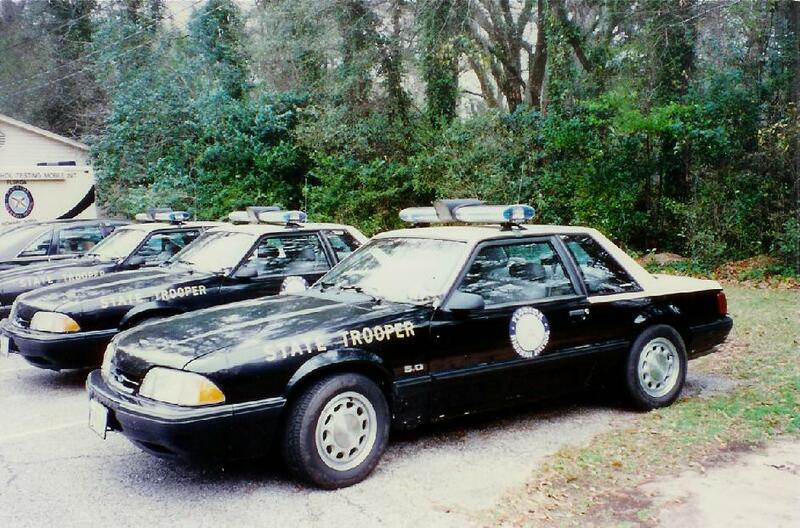 Last pic of 1992 FHP unit #1118. This car had Tomar rear deck lights. FHP Photo. 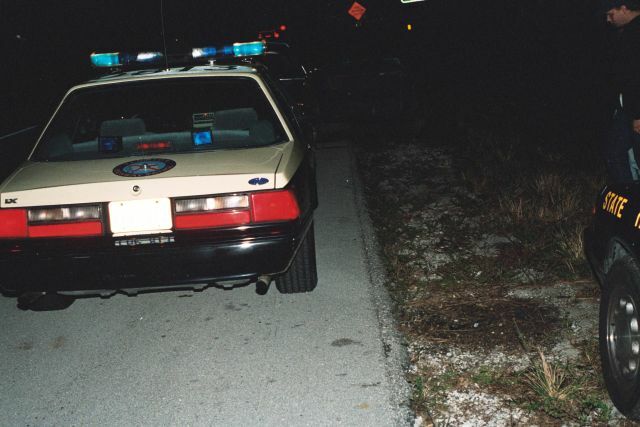 1992 FHP unit #1164, from a 1994 crash photo. This car had reflective "STATE TROOPER" fender lettering. FHP Photo. 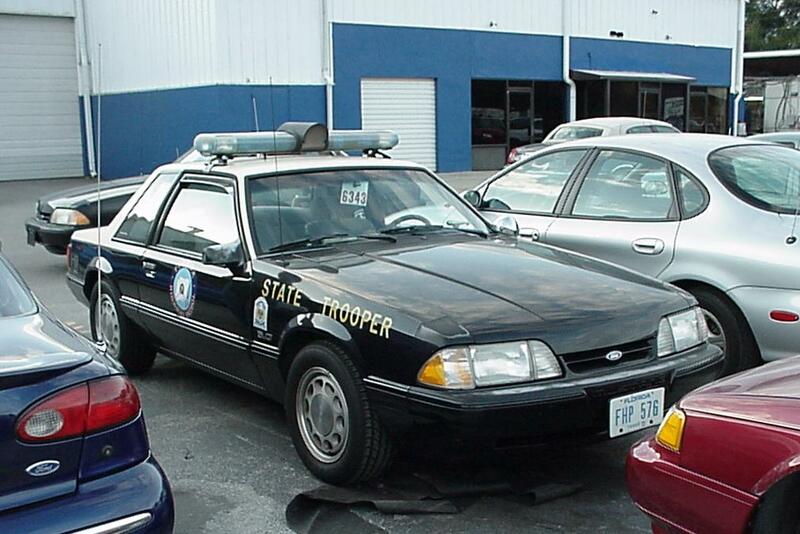 Front shot of 1992 FHP unit #1164. This car had a Federal BP100 siren speaker mounted on the front bumper and the Jetsonic speaker on the lightbar was removed and replaced by a rotating (TCL) light. Two single Dashmasters were also mounted on the dash. FHP Photo. 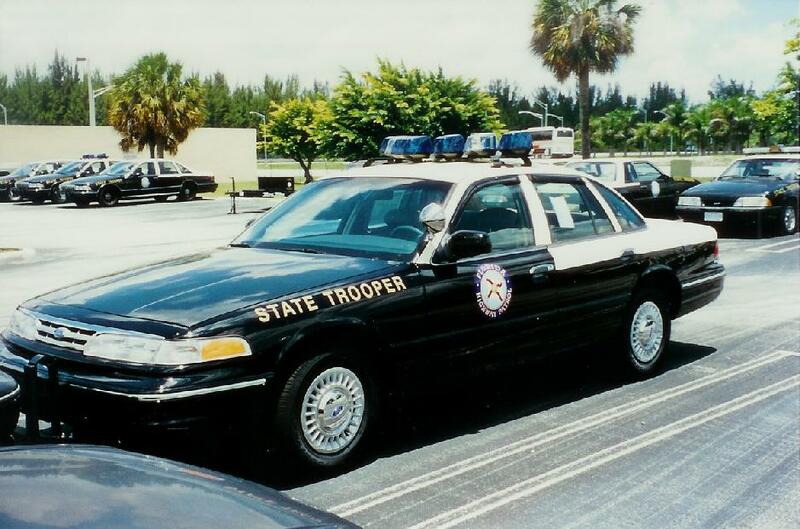 Another one of 1992 FHP unit #1164. This pic shows Dashmaster rear deck lights, a MPH K-55 radar on the dash, and a couple of CB antennae on the deck lid. FHP Photo. 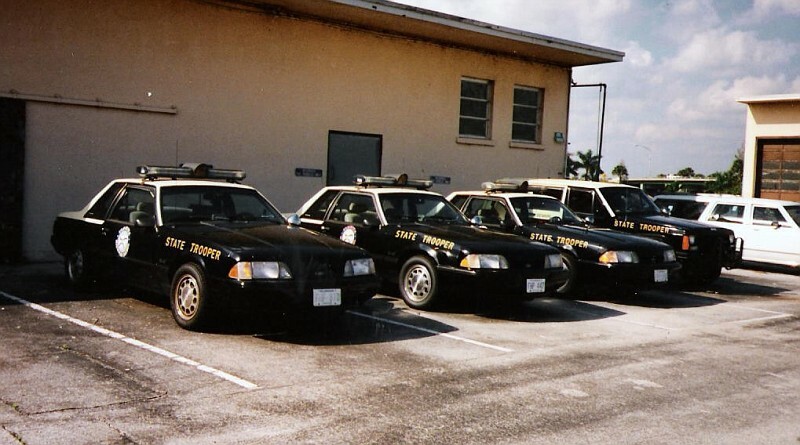 Last shot of 1992 FHP unit #1164. This is a nice shot of the factory applied tape stripe separating the cream paint from the black. FHP Photo. 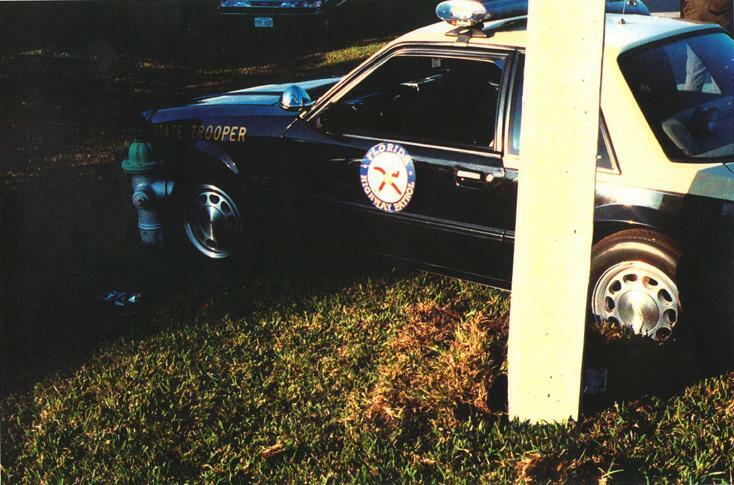 1993 FHP unit #813, 1995 crash photo (minor crash). FHP Photo. 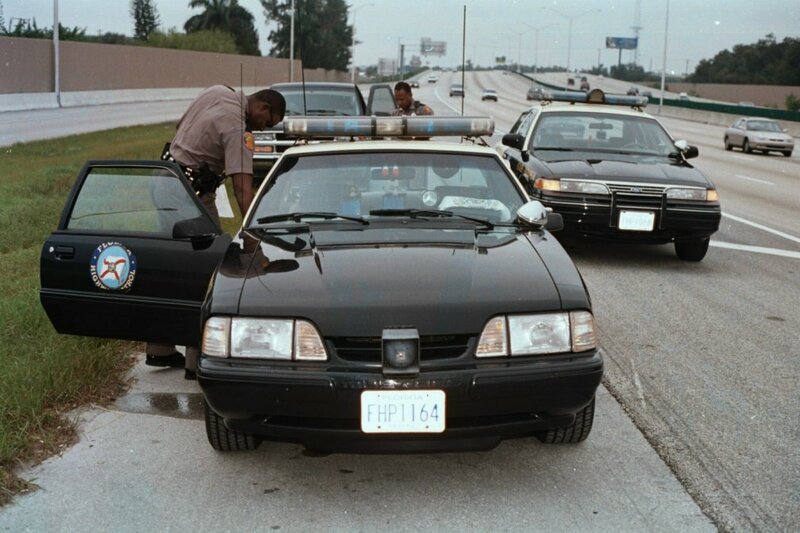 Same unit, 1993 FHP unit #813, 1999 crash photo (another minor crash). 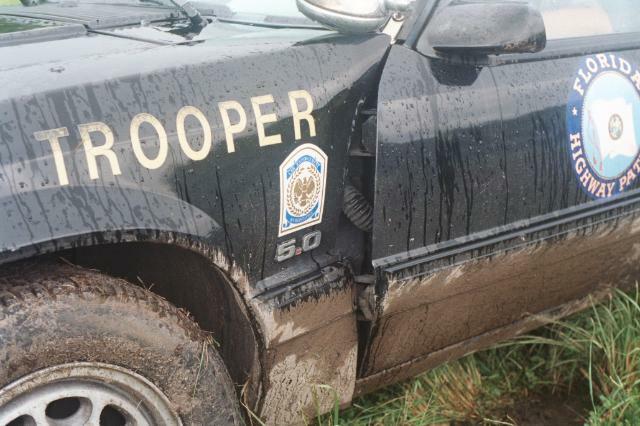 This photo shows the rear deck lettering and accreditation decal added (deck lettering was added in the late '90s to those cars still left in service). FHP Photo. 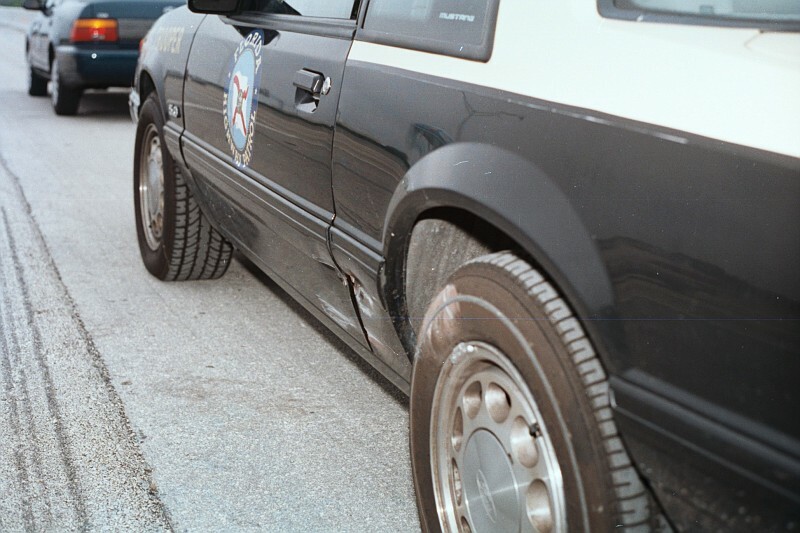 Last shot of 1993 FHP unit #813, close-up of the fender lettering (curved "R") and accreditation decal. FHP Photo. 1995 photo, lineup of 1992-1993 cars. Micor VHF antenna on the roof of all three, No vent visors on these. 1996 photo, with several Mustangs coming out of service in the background. 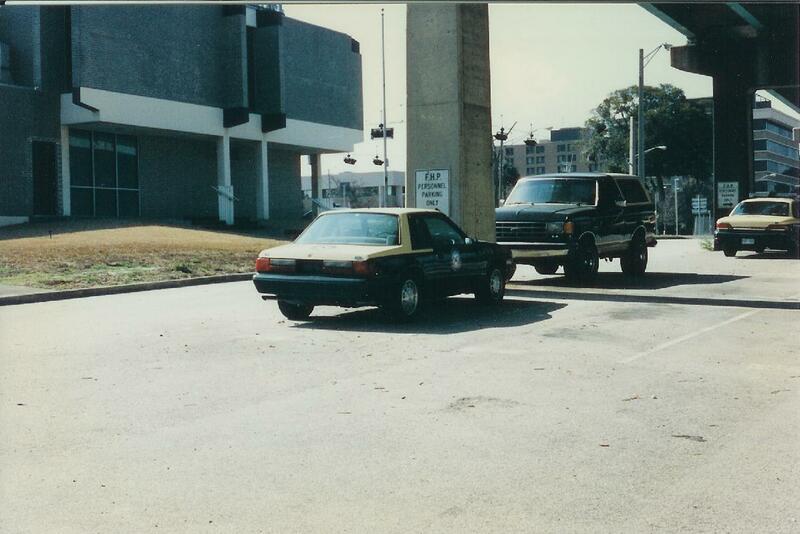 Unknown year on this photo, 1992 or 1993 Mustang coming out of service. The cars were stripped of lights, radio, and other equipment and sometimes sat this way for an extended period of time before being sent to auction. 1999 photo, 1993 FHP unit #576. 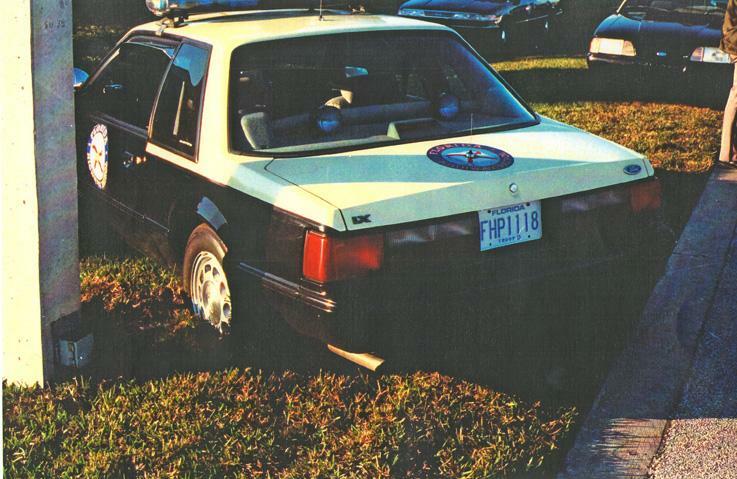 This Troop D unit car had both Micor and 800 MHz radios in it. 1999 photo, rear of unit #576. 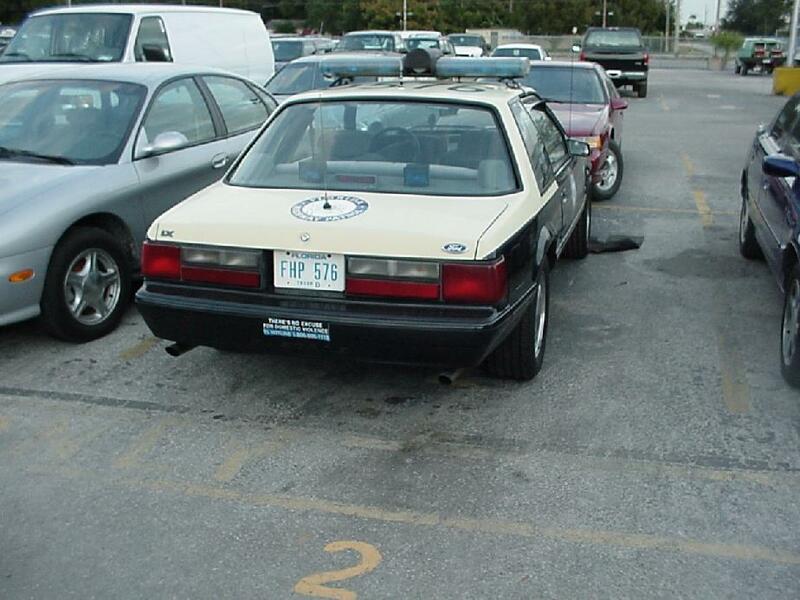 The Micor antenna was moved to the trunk on this car, while the 800MHz antenna is on the roof. There isn't an antenna for the repeater, as the 800MHz was now the primary radio being used by this time. 1999 photo, interior shot of #576. Micor, with 4 channel scan head on top of the clamshell, with 800MHz Spectra radio (remote head) as well. The JSS switchbox controlled the Jetsonic lightbar, and this car had a silver-faced, Federal PA 300 for the siren. 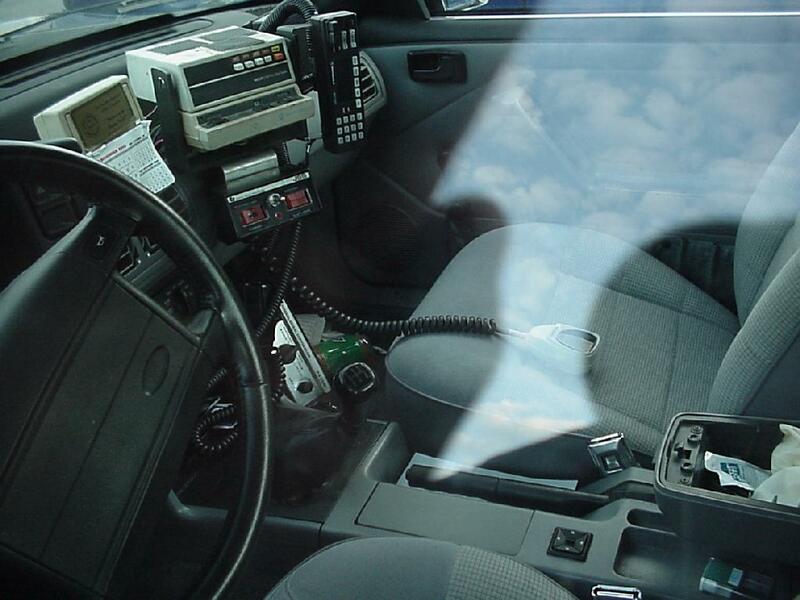 Another in-service, interior photo of a 1993 Mustang, unknown Troop. This car had a dual-head Micor, with a 4 channel scan head on top of the clamshell, but did not have an 800MHz system. FHP rolled out the 800 MHz system in stages, with many Mustangs never receiving them at all. The siren is a Whelen WS-295, and a VASCAR unit was also installed in the car.